It's always a bummer when you can't play with your friends because they're twice your level, but that's not gonna happen in Borderlands 3. 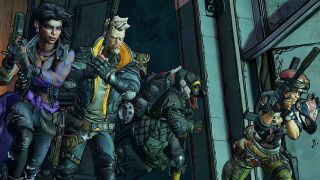 Though it didn't come up in the new Borderlands 3 announce trailer, the game's retail listings reveal that it will feature the series' first full-on level syncing system for cooperative play, letting anybody team up for effective combat and - just as importantly - get their own level-appropriate rewards. Here's the relevant part of the listing, pulled from GameStop: "Quick & Seamless Co-op Action - Play with anyone at any time online or in split-screen co-op, regardless of your level or mission progress. Take down enemies and challenges as a team, but reap rewards that are yours alone - no one misses out on loot." Previous Borderlands games would only take the host player's progress into account, meaning a low-level player joining a high-level game would do little damage but level up super fast, or a high-level player joining a low-level game would wreck house but not have much to show for it. It sounds like the new system will work some magic (not that kind of magic) in the background to ensure everybody gets similar challenges and rewards no matter how far off they may be from the host in terms of progress. It's a safe bet that it will work in both Borderlands 3 split-screen and online multiplayer. The retail listing is all we have to go on for now, so we don't know how Borderlands 3 will present the fact that you're not fighting at your standard character level, or whether you'll have the option to disable automatic scaling if you prefer. I know some Border-fans enjoyed being able to power-level friends with a dangerous trip to the Big Leagues and it'd be a shame if that old-school fun was left behind entirely. Another fun Borderlands 3 fact: It has a gun that runs around and yells insults at enemies. If that isn't enough for you, check out this video that decodes the secret messages in the first Borderlands 3 teaser.